It occurred to me yesterday that in all of the writing done since February, I've not written one thing about my beloved Yankees. This is obviously silly considering that my blog's name contains my favorite team's name! So, I thought I'd dedicate today to my favorite player #51 Bernie Williams. My love affair with the pin stripes is really life long. Dad raised me on baseball. He taught me how to keep score early. We've had countless conversations about players and stats, though I will never understand how he keeps them all straight in his head, much less master the skill. So, we are not fair weather Yankee fans. I was born and raised this way. Yankee baseball in the '90s was supremely exciting. They were World Series Champions 4 times! The proof is in the pudding! In 1998 alone, the team went 114-48. 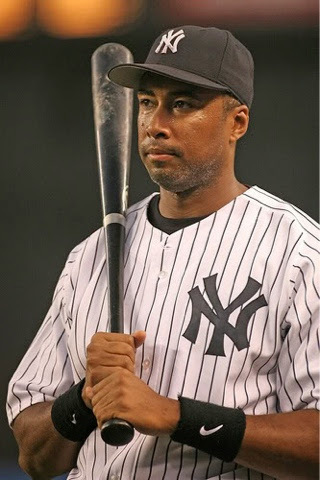 During this time, Bernie Williams was quietly playing his game and being awesome. Bernie was recruited at the age of 16. The earliest a kid can sign is 17, which he did with the Yankees on his 17th birthday. He played AA ball in Albany before moving up to debut in the bigs in 1991. Bernie was fast, Bernie was a switch hitter, and Bernie had a solid head on his shoulders. Despite Steinbrenner's occasional desire to trade this fine Center Fielder, Williams was born into baseball as a Yankee and he will one day retire as one. Bernie never officially acknowledged his retirement, like his younger teammate Derek Jeter will do after this season. It tugs at my heart that the last of that golden Yankee era is about to leave the dugout. During Bernie's reign as Yankees' Center Fielder, his batting average had its ups and downs. Career average was .297 with 2,336 hits and 287 Home Runs. His best season brought in incredible stats. In 1995, my favorite dude batted.429 and lead the team in runs, hits, and stolen bases in the postseason against the Seattle Mariners. Any baseball player can easily lose his golden status if he chokes in the post season (hello A-Rod), but Bernie held his own. He was underrated by Steinbrenner, but not by his biggest fans. ALCS MVP 1996, 4x Golden Glove Award winner, Silver Slugger Award, and AL batting Champion 1998 are all ways to prove that he was not underrated by MLB either. Off the field Bernie has found tremendous success as a musician. He continues to perform and has created a new golden status with his guitar. He's collaborated with some heavy hitters like Bruce Springstein and is signed by Paul McCartney's publishing company. This is only part of what makes him aswesome though. Bernie is an incredible philantropist. He started a national, nonprofit organization called Little Kids Rock that helps restore music education in disadvantaged public schools. It is easy to see why #51 is my favorite Yankee. He has done incredible things and brought honor to his team. The first time I ever saw him live was at a spring training game in Tampa, Florida. He walked right past me and I almost passed out. It was probably the biggest star struck moment I've ever had. He continues to shine in my eyes and he always will as my favorite Yankee player.